Driven by a rapidly expanding global population and a burgeoning middle class, overall Muslim lifestyle spending – including food, fashion, cosmetics, media and recreation – was worth an estimated $2.1tn in 2017. Muslim spending power has never been stronger – and hoteliers on the Turquoise Coast have been quick to respond. Some have converted existing hotels to be halal-friendly; other purpose-built resorts are springing up. Their restaurants serve halal food. The premises are alcohol-free. They provide prayer rooms and mosques, and broadcast the call to prayer over public address systems. Most resorts have screened-off women-only pools and beach areas, in which women can sunbathe in bikinis without fear of being seen by men. Boys over the age of five or six are banned, along with cameras and mobile phones. Spas and gyms have separate opening times for men and women. Organised entertainment is “family-friendly”. Basma Kahie, a fashion blogger, said she had previously had doubts about taking holidays because of the difficulties facing Muslim families. 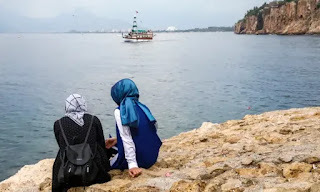 But after visiting a halal-friendly resort in Antalya last year with her husband and daughter, she was planning another holiday, this time with friends. “It was amazing not to have to worry about things that might compromise my religious beliefs,” she told the Observer.